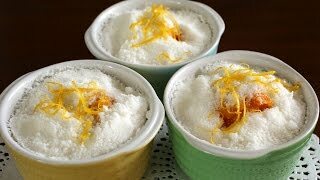 Today let’s make squash rice cake (Hobaktteok), using a small ceramic bowl or cup. I’m so excited to release this recipe because with it you can easily make fluffy rice cake and sweet squash filling. Ramekins work well, but you could try any other kind of similar-sized, heat-resistant bowl or cup, too. The nice thing about ramekins is that the final result looks pretty on the table. 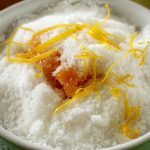 I like the contrast between the clean, white rice cake and the sweet, tangy, lemon-flavored, gooey, golden squash filling. Add more filling if you want. I use squash but you could use kabocha, too. Serve one small bowl per person as a light dessert or snack. It’s fun to scoop and eat, and the perfect size for one person. Enjoy the recipe, and let me know if you make it at home! Run the zester across the lemon in long threads. Set aside. Wash 1 small butternut squash and cut it in half lengthwise. Remove the seeds and stringy stuff. Cut the halves crosswise and put them in a heavy pot. Add 1 cup of water to the bottom of the pot. Cover and cook for 30 to 35 minutes over medium low heat, until the squash turns soft and tender. Remove from the heat and let cool. Scoop out the flesh with a spoon and transfer it to a bowl, discarding the skins. Mash the squash with a wooden spoon. Put ½ cup of the squash into a small pot. The remainder can be frozen for up to 1 month in a plastic bag, for later use. Add the honey and 1 tablespoon lemon juice. Heat up the pot and boil for about 5 minutes over medium high heat, stirring with a wooden spoon until the consistency turns into something a little thicker than apple sauce. Remove from the heat and set aside. Put the rice flour into a coarse sieve over a large bowl. Sift through the sieve and stir with a wooden spoon so that rice flour goes through and gets well aired. Remove any hard solids left over in the sieve. Sift and stir the rice flour a second time. Add 1 tablespoon lemon juice, salt, and sugar. Mix it all up between your palms, gently pressing out any wet lumps, until the rice flour is uniformly wet. Sift the rice flour again. Bring 6 cups of water in a steamer and boil. Put 1 to 2 teaspoons squash filling into the bottom of each ramekin. Use a spoon to fill each ramekin ⅔ full with rice flour, then add another dollop of squash filling. Top it up with some more rice flour, and garnish with the lemon zest. When the water in the steamer starts to boil, put the ramekins into the steamer. Cover and steam for 30 minutes over medium high heat. Serve right away. The rice cake will be fluffy for about 5 to 7 hours at room temperature. If you want to save some to serve later, let the rice cake cool for 30 minutes and then wrap it in plastic wrap and freeze. When you want serve it later, first thaw it out at room temperature. The rice cake will still be fluffy, but you could also microwave or steam again to refresh it. Posted on Saturday, September 19th, 2015 at 6:52 pm. Posted July 27th, 2016 at 8:39 pm | Log in to reply. Hi Maangchi! The look of this dish reminds me of 기정떡! Have you ever made it? I saw it on TV and was wondering what it tastes like! Posted November 2nd, 2015 at 7:48 pm | Log in to reply. Maangchi, this looks so good I ran out after I watched it and my squash is steaming now. I’m going to make Tofu Stew, this and some side dishes for my mother’s birthday. She is coming to visit me for the first time since I moved to Vancouver, BC. I think you are the cutest and I watch your video’s when I’m feeling down. You make me laugh and your food is soooo good. One of my very best friends is Korean and I love Korean drama, where they are always eating yummy looking stuff. That is how I got interested in Korean food. To date I’ve made quite a few of your recipes (Jajamyong, Kimchi Tofu Stew, fish cakes, dukkboki, beef and radish soup, bean sprout side dish, kimchi, your after school buns, and I can’t remember what else. Your videos are fun to watch and your recipes are always really clear. Like today in the squash recipe you happened to mention that the flour comes from the freezer section. Well, I walked down to a tiny little market just down the street from my house, looked in the freezer section and what do you know? The flour! If you hadn’t mentioned that, I would have looked for hours. You save me a lot of time because you remember the details. Thank you! Posted September 30th, 2015 at 2:02 pm | Log in to reply. When I do stuff with pumpkin or squash that needs prekooking usually I microwave it with a bit of water (1/2 cup or so) in a partially covered container. This shorten the cooking time a lot, and is very practical. Posted September 25th, 2015 at 8:52 pm | Log in to reply. Posted September 20th, 2015 at 5:20 am | Log in to reply. Posted September 20th, 2015 at 1:55 pm | Log in to reply. Posted September 20th, 2015 at 12:52 am | Log in to reply. Maangchi: What a wonderful dish: colorful, flavorful, pretty. Great job. And the “Maangchi Hot Mouth” is just too cute and precious!!! Love it!!! Posted September 25th, 2015 at 8:53 pm | Log in to reply. You are so very welcome, Maangchi!!! This recipe was originally posted on September 19, 2015 at 6:52 pm by Maangchi. The video was watched 807,128 times on YouTube & has 13,898 likes!